Are Hawthorn pretenders or premiership contenders? Sitting fourth on the ladder and boasting a percentage of 121.4 per cent, the question must now be asked: Can the Hawks surprise with another spectacular finals campaign only three years since their premiership three-peat? Few predicted at the beginning of the seasonthat the Hawks could challenge for a spot in this year’s finals. However, with only two rounds remaining in the home-and-away season Hawthorn have become a genuine top-four threat. Saturday’s blockbuster saw Hawthorn hold off a spirited Geelong comeback. The nailbiting contest between the two rivals ended with the Hawks taking home another four points. In his post-match press conference coach Alastair Clarkson commented that the game had a “finals-type atmosphere”. So are the Hawks really a chance to challenge for the flag? Firstly, this will depend on whether they can maintain their top-eight form and ideally their position in the top four. With Collingwood and Sydney breathing down their necks, the Hawks must beat both St Kilda and Sydney, the latter of which is fighting tooth-and-nail for a spot in finals themselves. Earlier this season Hawthorn embarrassed the underperforming Saints, winning 89 to 54. The Swans, however, are a different kettle of fish. The two teams have developed a fierce rivalry in recent years, with Sydney defeating the Hawks by eight points in their most recent Beyond Blue encounter. 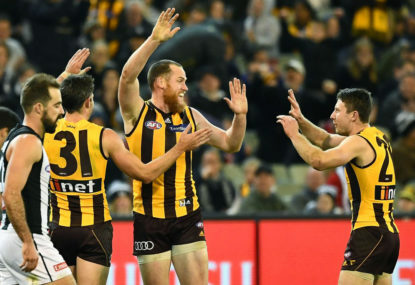 Making finals in the 2018 season remains as difficult a task for Hawthorn as it does for all the teams currently stuck in the ladder logjam. However, assuming that Clarkson can outcoach his colleagues in the remaining rounds, there is no doubt that the Hawks can make a real dint in September. Hawthorn have already demonstrated their ability against some of this season’s biggest contenders. What seemed like a regulation win against the Pies in the season opener can be seen in hindsight as a genuine humbling of Nathan Buckley’s best 22. In Round 4 Hawthorn put Melbourne to the sword with a 67-point thumping, and more recently they were able to expose the cracks in Port Adelaide’s brand of footy. Of course the ultimate success for any team this September will involve taking on the competition’s most in-form team, Richmond. 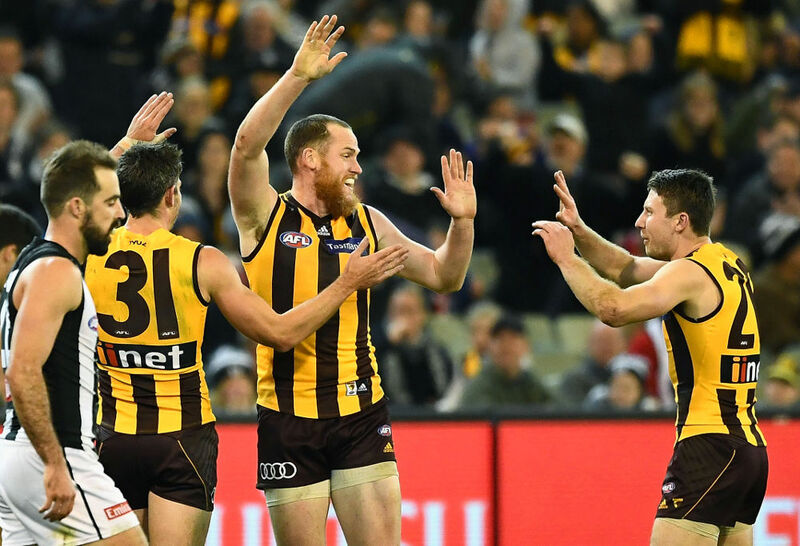 If Hawthorn are able to maintain their current position, it will all but certainly set up a mouthwatering first-round finals clash against the Tigers at the MCG. One of Richmond’s biggest strengths is their ability to win games at the MCG. This home-ground advantage is what puts them ahead of both GWS and West Coast in grand final discussions. The Hawks are no strangers to the home of footy and have won seven of their nine games at the ‘G this season. Richmond’s 13-point win over Hawthorn in Round 3 has been Richmond’s second-smallest margin in their 19 consecutive victories at the ground. While the football world remains determined that the flag is Richmond’s for the taking, it would be foolish to dismiss the experience and class of Alastair Clarkson and his men. Only time will tell what more this club can achieve, but with 14 premiership players still on their list and several strong recruits, including this year’s Brownlow favourite, Hawthorn may just be a chance to pinch the flag from under everyone’s noses.